Painting over permanent marker stains sounds like an easy solution for "removing" a permanent marker mark from a wall, but if you use the wrong type of paint, the marker may actually still be visible through the paint or it may reappear weeks or even months later. 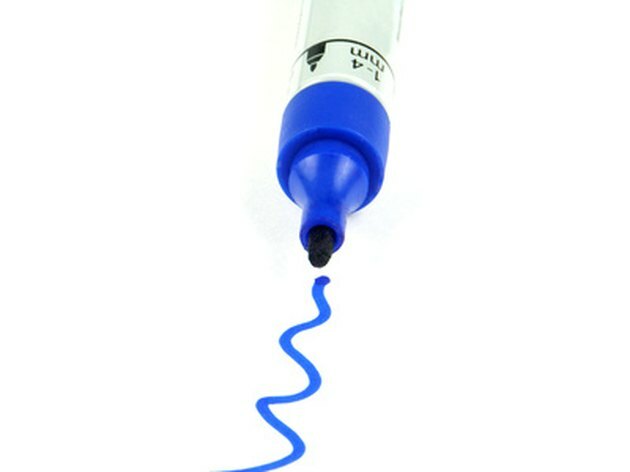 While permanent markers are intended to permanently mark surfaces, you can fade and cover the marker without fear of it resurfacing by using products available at your local home improvement store. You don't have to live with permanent marker scribbles on your walls. Moisten a paper towel with rubbing alcohol and blot the writing with the damp towel to remove as much of the permanent marker as possible before you begin painting. Avoid rubbing the mark, because you may smear the ink and make the stain worse. Clean the area with a mixture of 1/4 cup ammonia and 1 gallon water. Apply the cleaning solution with a rag to remove any dirt or grease that may prevent the paint from properly adhering to the surface. Rinse away the cleaner by wiping the area with a rag dampened in clean water. Apply an primer-sealer paint over the entire wall or surface stained by the permanent marker, using a paint roller or paintbrush. For best results, look for a product that claims to cover stains with one coat. Let the primer dry overnight and check to see if the permanent marker is visible. Apply a second coat of primer if the marker is still visible. Paint the primed surface with any color of paint. Refer to the labeling on the primer-sealer to determine which type of paint you should use. An oil-based primer-sealer may recommend using oil-based paint, while some primer-sealers are appropriate for both water and oil-based paints.